Mostly what I associate with the First World War is silence. In History class, we would look at photographs of the soldiers and occasionally watch a documentary where you could see early footage, black and white and soundless, the soldiers pushing their way through the trenches in that token sped up pace of early cinema. It might sound strange, but in a way, the propaganda paintings seemed more real to us kids of the 90s brought up in an era of colour television and films pulsating with special effects. Every time one of the teachers would ask us if we could imagine the horror of it all and every time there’d be a silence before someone might duly parrot the correct response which we had all learned from watching films and reading historical novels and flicking ahead in our textbooks. That initial reply was probably the most honest. There was the national silence, every year on the 11th day of the 11th month where we stood in our form rows for two minutes, waiting for the nervous blast of the Last Post to announce our duty was done. In church we would often hear sermons relating to the untold experiences of the soldiers from those older members of the congregation who might remember their mentally battered fathers, uncles and grandfathers. These men returned in silence, never to discuss their experiences and that silence killed some of them. There was also the silence of memory. My family is not one to talk of history except for as amusing anecdotes. Being on the losing side (colonialism, independence, civil war) can do that. However, every now and then my mother mentions her great Uncle George in that distant way people remember adults from their childhood. The way she describes him, I have always imagined him as a tall, wiry and dark Igbo man with a calm expression that’s often read as arrogance by outsiders, perhaps insolence by his British officers. He fought in that war, she says, but nobody ever said anything about it. He certainly never spoke about it. She never asked, too young to do so. As it happened, she couldn’t ask him because he hadn’t returned. For those of you who are Nigerian or familiar with our cultures, it won’t be a revelation if I say that there’s a way Igbo people like my mother talk about the deceased which when translated into English-think, (as I call it. Understanding a language is often about thinking the right way so much as speaking), makes it sound like they’re still physically alive. For example, as a child I used to think my paternal Grandmother was still living present on Earth even though I had never met her. It was comparatively recently I finally asked my father when she’d died. I was told that had happened sometime around 1976. There I remembered me being a child in 1994, kicking pebbles along the ground on my way to school and wondering if she was the relative who had fallen ill that everyone was so worried about! Anyway. The fact is, I realise now that everything she knew about Great Uncle George came from the adults in our ancestral village. There was an additional reason his story was told so often. Before he left for the war, he had just got married – it was his pregnant wife who had seen her young husband off. The son that was born to her was named after his father. When I think about our family troubles – little George as it turned out grew to be one of the numerous family rogues who I know as Uncle George – it gives a more complex picture of colonialism’s impact upon our societies. The similarities aboundeth. In many ways, the impact of racism upon the family of the colonised does not change, whether in 1900’s Nigeria, or 1980’s Britain. Sometimes she wonders out loud about what he must have seen, what he must have experienced, the suffering he must have gone through, but he is no longer there to ask. 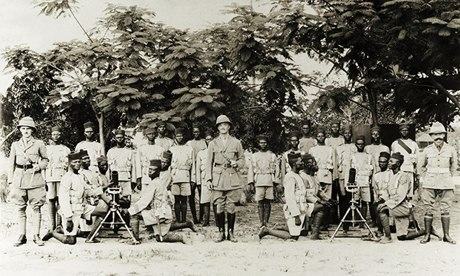 We can only imagine, drawing on remaining diaries and letters of other colonial soldiers some of whom like him came from comfortable families in comfortable villages, some eager to serve the motherland, some seeking adventure, some yearning to leave the daily grind of small town life. I wonder about his comrades who must have left with him but did not return, friends from school, friends from his age grade. I wonder how his experiences changed him and the way he saw the world. Some did leave eager to serve the motherland, and I think it’s important to reflect those narratives. I think one of the saddest aspects of talking to my parents about colonialism is realising that in a way it was not anger at racial injustice that provoked them, but a sense of betrayal. In fairness, this is truer of my father, as he is part of a generation born decades before independence, whereas my mother grew up in an independent Nigeria. That betrayal came when arriving in the so-called ‘motherland’, the land of the Anglican Church and Shakespeare, the culture of which they had been taught to mimic, and discovering that their mother did not know them (and still doesn’t but that’s another post). 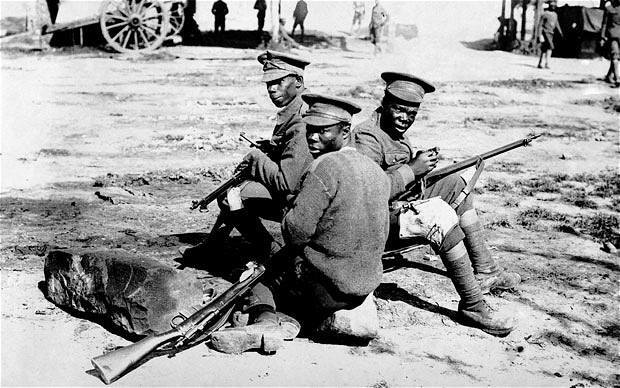 In some senses, the anger of the colonised African was partly the anger of a broken heart. But no, there is something darker in the way my mother told it. He was taken, she said. Being born in the late 1960s, she certainly wouldn’t have been there to see it. This is what the elders told her – he, and the other men, were taken. We Igbos like euphemism, even thoroughly British diasporans like me. Nothing can be said that can’t be made better wrapped in proverb and suggestion. As such, I can’t express how much that chilled me when my mother said that. That’s what she, and the young George Jnr and the others of her generation would have been told about their vanished fathers and grandfathers. They had been taken to fight in a war somewhere overseas. And they had never returned. Mostly I wonder about how hard it is to fully appreciate what he and others like him went through. The further we move from his war and the hazier the recollections become, layered with memories of more recent conflicts, the more effort it takes to pay attention and remember. As a lover of history, I don’t like forgetting and I don’t like silence. Even though it can be painful, it is a good thing to weave the truth together from what strands of memory and evidence can be found. It’s something worth doing, even if it might seem a thankless task. And it is, especially in our current age. When faced with the void – of ignorance, uncertainty, or death – we tend to comfort ourselves with a pseudo-stoic “well, what does it matter really?” which is certainly better than killing each other over whose interpretation of the Communist manifesto is a closer adherence to the fundamental principles of revolution. It’s a hard to thing to balance a mature stoicism with that deeply, wonderfully childish desire to know. It’s harder as well when it seems to me so much of contemporary Nigeria is desperate to look away. It doesn’t want to look at its past. Is that because it thinks there’s nothing there it can learn from it? Is that because its too shameful to bear the sight of? I don’t really know because in a way Nigeria is also obsessed with the past, old grudges and wrongs between political parties and ethnic groups, between caste, class and creed. We need to remind ourselves that our history is our own. It might not be nice, but its ours. We should be using this centenary as an opportunity to discuss how we also fought, how the oppressions that contributed to the First World War, sent ripples through the rest of the world. Where are our memorials? Where are our anthems for the dead? Or are we too scared to begin lest we never end? Previous Previous post: For Shame!